Whether you love bird watching or taking pristine photos of other wildlife in nature, the Celestron 52304 M2 65ED Spotting Scope can help you take the perfect pictures. Celestron is a trusted brand when it comes to creating a multitude of different scopes to give the user the best-quality view possible. This M2 series spotting scope is made from state-of-the-art materials to ensure maximum durability that allows you to use it in any type of weather. The scope also comes with a variety of adjustable options as well as accessory upgrades to make your viewing experience even better. For years, Celestron has been creating high-quality optics. They make telescopes to view the stars, microscopes for the smallest objects on earth, binoculars and best of all they make spotting scopes. Celestron ensures that that they keep up with the latest technology by creating smartphone and tablet apps for your convenient. Not only can you access different Celestron apps, but they also make accessories that allow you to hook up your smartphone to this M2 series spotting scope. Their goal is to stay on top of innovation and provide the best quality possible for every one of their customers. Celestrong has created the Regal M2 65ED Spotting Scope with a magnesium alloy body. It’s light in weight, extremely strong and durable. Celestron understands that outdoorsman who use their products trudge through some rough terrain, so they ensure that this spotting scope can take a hit if it were to drop. The material is completely waterproof as well, so whether it’s raining or snowing when you’re out spotting wildlife, you won’t have to worry about water damage. The lens in the M2 65ED Spotting Scope is created with the same proprietary material that Celestron uses for their best telescope that helps astronomers view stars and galaxies millions of miles away. When you purchase this spotting scope, you’ll have the choice of a three different sizes that include 65mm, 80mm and 100mm. The extra-low dispersion glass helps you spot the tiniest of creatures hidden in brush or in the dimmest of light by providing maximum light transmission. No matter what the situation may be, you can rest assured that you’ll have bright, sharp images. The scope also has an easily-accessible dual focus knob so you can quickly spot your subject with crystal-clear quality. Celestron has engineered this spotting scope to provide the maximum amount of comfort for anyone who is using it. The tripod that the spotting scope sits on is completely adjustable. You’ll be able to adjust the height and the angle of the spotting scope with ease to get the perfect angle. 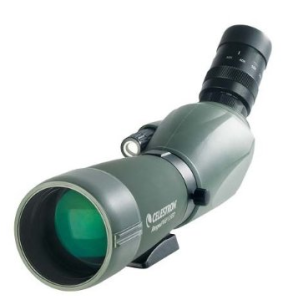 The spotting scope also comes with a fully adjustable lens shade and twist-up eyecup. You’ll be able to instantly share the photos you take with the 65ED Spotting Scope with the smartphone adaptor that’s compatible with a variety of iPhone and Android products. This adaptor lets you attach your camera to the twist-up lens to take perfect pictures to save to your phone and easily upload the photos to your social media accounts or email them to friends and family. Another great accessory that Celestron makes for this scope is the stay-on case. This case gives you extra protection from the elements while not hindering the quality of your viewing. When you want to experience nature and wildlife at its finest, the Regal M2 65ED Spotting Scope is one of the best on the market and backed by a limited lifetime warranty. For enthusiastic amateur viewers, the Celestron 52304 Regal M2 65ED Spotting Scope makes a sound choice. It features many standout components, including an ED objective lens, XLT coatings and a rotating tripod mount. The quality of images is exceptional. The telescope comes in a durable magnesium alloy body, which gives users the confidence to take it out in all types of viewing conditions. This scope also offers uncommonly good features for an average price. This makes astronomers looking for a solid, high-performing telescope at a reasonable price quite happy. The objective lens, a notable feature, produces a clear and vivid image. It replicates images in a high quality and precise color scheme. The lens has a 16-48x eyepiece with automatic zoon. It also reduces chromatic aberration and shows remarkable contrast. The eyepiece mount measures 1.25 inches — a standard dimension that makes the scope compatible with many types of telescope eyepieces. The eyepiece has a diverse magnification range, a rubber eyecup and a 20mm eye relief, which enables comfortable and accurate viewing for long viewing sessions. In addition to enabling easy adjustments and creating a precise, clear image, the lens has a special coating –Celestron’s own—that enriches color and produces a bright picture. This coating includes BaK-4 prisms and a low-dispersion ED glass piece that reduces chromatic aberration but expertly gathers light to produce a great photo. The Regal M2 boasts a long-rang viewing field of 1,000 yards and has a 16.4 foot, or 5-meter, close focus capacity for clarity and precision. This telescope has several adjustments and mechanisms to help astronomers customize the scope to their specific viewing needs. The Celestron rests on a rotating tripod, which makes setting up and changing positions a breeze. Rounding out the tripod’s notable features are a ¼-inch mounting socket and sighting aid. A sliding sunshade lets users allow or seal out the correct amount of light for the best viewing, while a dual-focus mechanism makes the scope perfect for looking at objects nearby and afar. Once in position, the tripod locks in place with a special locking system. This gives viewers peace of mind knowing that the scope will stay safely in place. The Regal M2 comes with a T-adapter ring, which helps astronomers easily mount a DSLR camera to the objective assembly. In less than a minute, viewers can transition from tradition viewing to digital viewing and back again. This feature is one of the scope’s greatest assets, as it makes it perfect for traditional astronomers as well as the more technologically oriented crowd. Users can adjust the scope with a set of coarse and fine adjustments to create a personalized and enjoyable experience. The Regal M2 weighs in at 46.8 ounces, which makes it a bit heavier than other scopes in its class. This excess weight comes in handy for stabilizing the scope in a prime viewing location, but makes it less transportable. In addition to stability, the Regal M2 is constructed with magnesium alloy, which makes it ideal for withstanding all types of weather conditions. It also resists erosion, thanks to a proprietary addition of nitrogen filling, which protects them from the inside. The nitrogen filling also does double duty by keeping the viewing pieces from fogging up. Overall, the Celestron 52304 Regal M2 65ED Spotting Scope makes a fine instrument for amateur astronomers looking for a high-quality device without spending a fortune. The scope’s rugged design and versatility make it perfect for other outdoor viewing activities too, such as birding and looking at insects. As a bonus, this instrument comes with sturdy carrying cases to transport the components with care and ease.